We offer small wall-plug switching power supplies to power our systems. 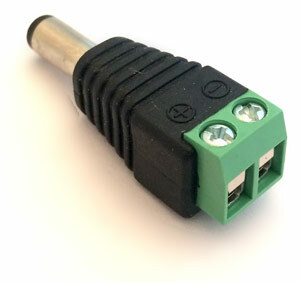 We also offer barrel to terminal adapters, both in and out styles, to connect your own supplies or buss wiring. Many folks have asked how to use their own power supplies with our equipment. Switching or regulated supplies of the appropriate voltage should all work well with our systems. A few switching power supplies have a high frequency noise in their outputs which requires the circuit to be grounded (Click to read more about grounding troublesome circuits). Switching power supplies are usually easy to identify because they are much lighter in weight, since they use tiny coils instead of heavy transformers. Touch Toggles and their Bases are pretty durable electronically. None of the power issues discussed here will damage our systems, except for reversing polarity. Be very careful not to reverse the plus and minus leads on any device! Most old DC transformers supply rectified or unfiltered* direct current (* The complete description below will help explain what that means). An electronic filter is needed to use that power with our 12 volt systems. This is a simple circuit to filter DC for 12v power to Bases. A diode is included so that this modest filter capacitor won’t accidentally try to filter the power for a whole layout. The filtered DC output can power a string of Touch Toggle Bases. We recommend about one amp of supply current for every twenty four Touch Toggles and their Bases. The power sharing pins on our Bases can handle up to two amps. A fuse is recommended for any power supply over 1 amp. Always check the filtered output with a meter before using it. A filter will output the peak voltage of a fluctuating supply. Be sure not to exceed 15 volts for a Relay Base, 18 volts for a Direct Base, or 24 volts for a Snap Action Base. Excessive voltage can overheat or overdrive some smaller modern equipment, so be careful to test actual operations before approving any combination of equipment. Note: Do not try to use older power supplies with our 5 volt systems. Smoke will come out. The 5v electronics need regulated DC. Alternating current (AC) electricity changes polarity back and forth sixty times a second in North America, and fifty times in Europe and lots of other places. Transmitted power has almost always done this (in spite of what Mr. Edison wanted) so that it could go through a transformer and exchange current (in Amps) for electrical “pressure” (Volts). Since the total power (Watts) is the Volts multiplied by the Amps, this is an even trade and works out very well. Power coming out of an old transformer or “Power Pack” is dropped about ten times in voltage from 120v to 12v. Note that the nominal 12 volts is really the average, with voltage at some moments more and some less. In order to turn this AC that changes from above and below zero volts, into direct current (DC) that always stays above zero volts, the simplest solid state device is used called a Diode. A Diode (which means “two active poles”) lets electricity flow through one way but not the other. It’s electrical symbol looks like a line for the wire, and an arrow like symbol for the one-way gate. Four diodes forming a square will create a simple rectifier (which means “makes right”). In a basic way this turns AC into DC. When the AC current is positive the electricity will flow through the top-right diode, through the DC circuit, and back through the bottom-left diode. When the AC current is reversed a moment later, current will flow through the bottom-right diode, through the DC circuit, and back to the top AC wire through the top-left diode. This way, when AC is delivered to the top and bottom corners of the diamond in the drawing all the positive flow is directed to the plus DC output wire, and all the negative flow is drawn from the minus wire. You can see that this is technically DC, but a bit crude. For a start, the voltage goes to zero every so often just for an instant. Lights and motors might not mind this, but you can imagine that electronics find that being turned off many times a second can affect performance. This was about the best you could get from any power-pack supply until the 1970s or 1980s. Newer “Switching” power supplies work differently, but deliver this same smooth dependable type of DC as the common regulator. It’s good to know that most older large capacitors don’t age well, so many 50 year old supplies that did have a big capacitor probably don’t any more. You won’t go wrong replacing or just adding an extra capacitor to an old supply. Really old capacitors can let some electricity through, overheat, and short out some of the power, so be careful. Most large capacitors have a plus and minus lead. Be careful to connect them correctly; They will fail immediately and smell very bad if powered up backwards.